Do you find that you have an insatiable appetite to take flight? Whether or not you’ve done it before, riding a zip line is a thrilling experience. The combination of wind in your face, the whirring of the pulley, and the ground rushing by underfoot create an experience that will be remembered for years. The best part of it is that it’s within the ability level of most people. 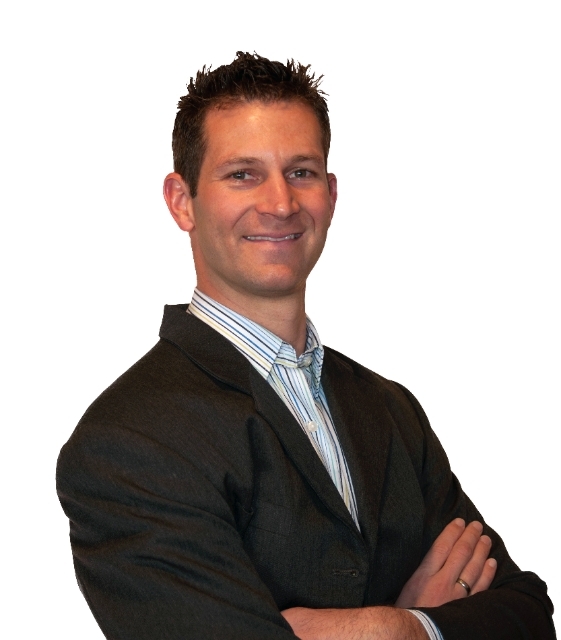 While there is only one main zip line option within St George, there are a couple more within a 1 to 2 hour drive. If you want an emotionally challenging experience but want to avoid the physicality of rock climbing and rappelling, then Zip line tours are just for you. There are two different zip line tours here in the St George Area, but both of them are in completely different environments. Fly high over the Mojave Desert, or ride 5 zip-lines over and through the lush canopy of the Santa Clara river canyon with Paragon Adventure. Each of these tours give you the chance to discover something new about yourself and maybe even push yourself out of your comfort zone. 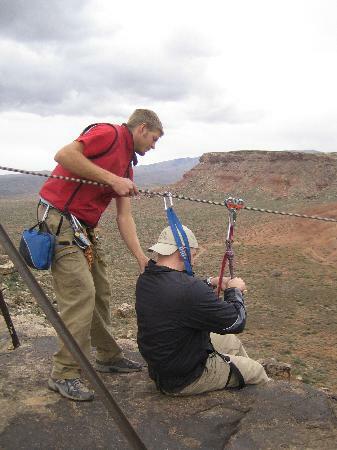 With that said, Paragon guides have any and all safety training and techniques you would ever need and will help you feel at ease and as comfortable as possible as you go on the tour. Just through Zion National Park, about an hour and a half away from St George, is Zion Ponderosa Ranch Resort. 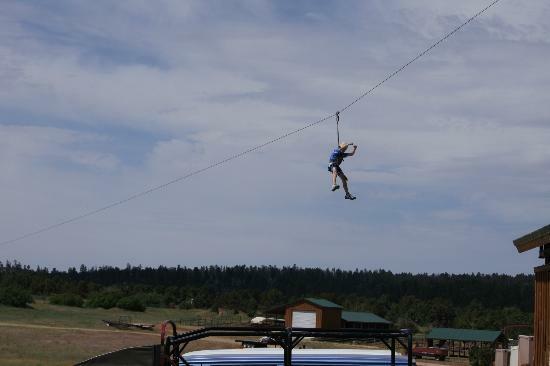 One of the more popular activities at Ponderosa Ranch Resort is their zip line. 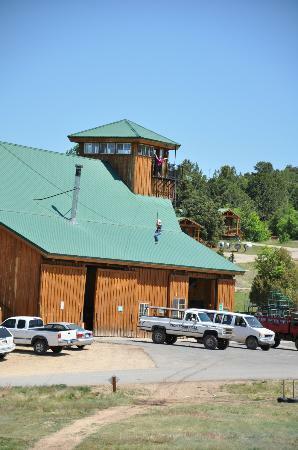 Guests begin by climbing up to the top of the activity barn where they have a harness and helmet put on. Once that is done you are hooked up and then get the ride-of-your-life while traveling a distance longer than a football field. Once done, you'll be able to run back and ride the zip line again and again until it gets dark. 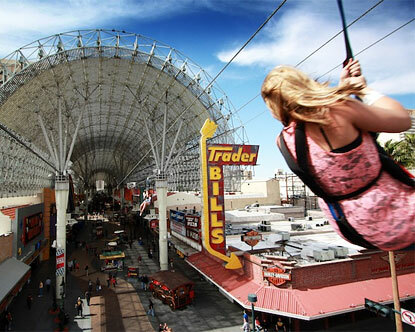 In downtown Las Vegas, about 2 hours from St George, there is a zip lining experience like nothing else you’ve ever seen. Fremont Street Flightlinez gives guests the chance to fly down the full length of the Fremont Street Experience‘s Viva Vision canopy at speeds of up to 30 miles per hour. There are four lines that run for 800 feet under the canopy, which has a $70 million dollar video screen of glittering lights. While the zip line does open daily at 12 noon, it’s recommended that you do it at night for the best experience. Occasionally there is a zip line company that comes through town and sets up shop at the Sunset Corner which appropriately named is at the corner of Sunset Boulevard and Bluff Street. Their lines go over the parking area of the plaza and offer family fun for all ages.